If you are a fan of costume designer Janie Bryant from Mad Men, then I highly recommend Elle.com’s new interview. 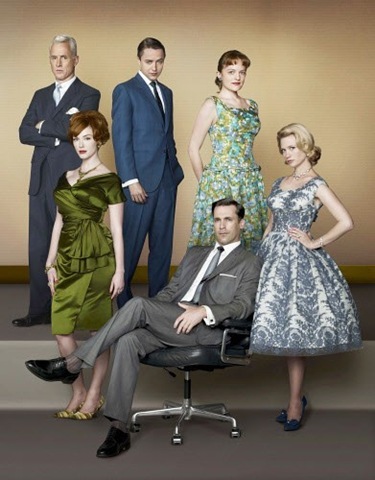 Find out which movie stars inspire Bryant’s designs for the uber cool cast of Mad Men actresses and how to incorporate their look into your own wardrobe. 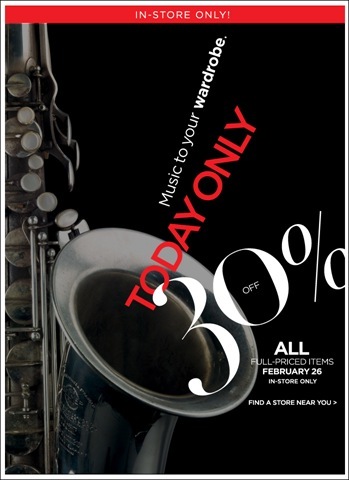 Save 30% on full priced items In-Store Only today at Banana Republic. See store for details. Were The 2009 Collections More Diverse At NYFW? Check out the statistics put together by the blog Jezebel on the diversity quotient for the NYFW runway models. You may also be interested to know which designers did not cast one model of color–the results may surprise you. Speaking of surprises, according to the Cut, rapper, former back up dancer and Britney’s babies daddy—Kevin Federline is said to be developing a line of children’s clothing. “It’s a really tough business, I’m trying to take it seriously and make a quality product for kids but not have parents pay like $500 or something ridiculous for a pair of jeans," he told WWD. Folks are gasping at the site of Lindsay Lohan these days and not because of her substance abuse. It seems that LiLo has a serious weight issue going on. The two photos on the left are from May and June 2008 respectively and the last is her most recent photo–taken this month. "I eat. I had my Big Mac yesterday from McDonald’s," she told Us Sunday at the Matthew Williamson NYC store opening. "I eat just as much as I always have." The 22-year-old actress (who has raised eyebrows before for her skinny frame) said she thinks she has just been "working a lot." She said she also blames "stress … and lack of sleep when I travel." Honestly, PLEASE eat a few of those Big Mac’s more often, you look unwell. Do you remember the Pac Man themed fashions I posted on Halloween last year? 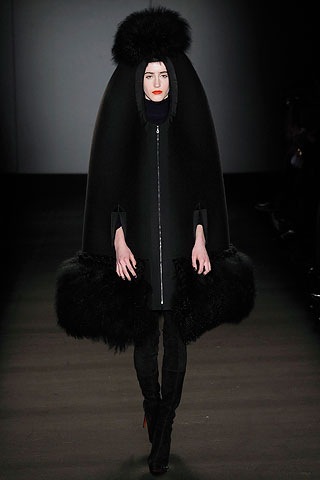 Well Giles Deacon didn’t disappoint during London Fashion Week with this zip-up party hat and the herculean proportions on the cropped jacket below. While I’m at it, here’s a few doozies that are worth noting from NYFW. Starting with these remarkably phallic ensembles. Click on each image for complete collection and designer information. Say hello to the hottest new accessory for spring. In a reversal of fortune for the high priced seasonal designer handbag, otherwise known at the “it” bag- bangles, bracelets and cuffs are all making a comeback this spring. Seen stacked high and dancing on the arms of runway models, bracelets add a little personality to your overall look. Although the price of some bracelets combined can cost just as much as a designer bag (think Hermès) stores like Forever 21 and H&M offer some of springs latest trends for a fraction of the price. To get the runway look, why not use the above photos or pictures from your favorite fashion magazine, as a guide while shopping? Here are a few other options I found online in a variety of price points. Today’s fashion lesson highlights a few spring trends for the Pear Shape. Click on images for shopping information. This dress from J.Crew has a flattering silhouette for a woman with a tiny waist and fuller thighs. Pairing it with a pop of color will brighten your spirits and add a little personality to a basic LBD. One word of caution though, stick with just one colorful accessory. Otherwise, you may look a little too bright. Lucky for the pear shaped lady, just about everything was belted during the spring 2009 shows. You will look fantastic belting everything from sweaters to jackets and blouses to dresses. Take advantage of this trend with any number of the above suggestions. A staple for every spring collection, the nautical theme has lasting appeal. A boat neck sweater broadens a pear’s narrow shoulders while a pair of wide leg trousers falling from the curve of your thigh gives you a lean look in these dark washed jeans. The A-line skirt above flatters your small waist and when paired with a pair of flesh toned shoes, your legs will appear exceptionally long. Do you have a fashion related question that you would like Fashion Sensei to answer? 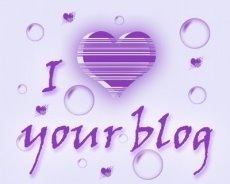 Be sure to visit Ask Fashion Sensei and your question may be featured in a future Fashion Lesson. In celebration of Barbie’s 50th birthday, the doll who has everything, will have a fashion show in her honor on Valentine’s Day. In tribute to each of Barbie’s years 50 years, 50 of fashion’s biggest names will be designing Barbie inspired confections for life size models while stomp’n it out in Christian Louboutin shoes. The color? Pink of course. According to Entertainment Weekly, the sequel to last spring’s SATC movie is set to start filming this summer. Although none of the four stars have formally signed a contract, all are said to be on board. It will be interesting to see if the girls will be touched by our real life economy. I’m curious to see if any of the girls have joined the recessionista crowd or how Big’s investments are doing. Fans of the acclaimed AMC show Mad Men will be thrilled to hear that costume designer Janie Bryant is developing her own clothing line. Bryant who was nominated for a 2009 Costume Designers Guild Award (and should have won) inspired designers Michael Kors and Peter Som’s fall 2008 collections with her 60’s style pencil skirts and suits.